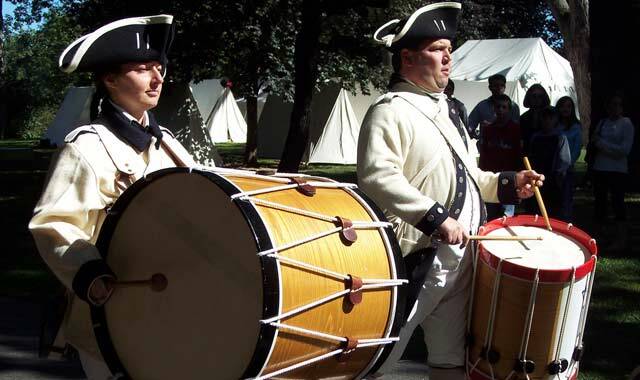 Get a living history lesson and have fun at the same time, when more than 600 Revolutionary War reenactors converge on Cantigny in Wheaton, Sept. 8-9. July 4-8, 11 a.m. daily. Delicious food from more than 20 local vendors, carnival rides, live entertainment daily and the region’s largest fireworks display on July 4th. Free parking, admission. A partnership by Elgin, Hanover Park, Hanover Township and Hoffman Estates. Sears Centre Arena, 5333 Prairie Stone Pkwy., Hoffman Estates, NorthwestFourthFest.com. July 8, 10 a.m.-4 p.m. Theme: “Hats Off to Home Towns,” so visitors are encouraged to wear fun, unique hats. Baking contests, barbershop quartet, quilt bed turning, vintage clothing, books, plants, “white elephant” sales. Antique/collectibles auction, magic show, more. McHenry County Historical Society, 6422 Main St., Union, (815) 923-2267, mchsonline.org. July 13-22, events daily. The weeklong celebration includes parade, carnival rides, food, craft fair, car show, drum and bugle corp competition, live musical entertainment, more. Peterson Park, McCullom Lake Road, McHenry, mchenrychamber.com. July 22, 6:30 a.m. race start. Chip-timed 0.5 or 1 mile swim in Bangs Lake, 15- or 24-mile bike ride and 3.1- or 6.2-mile run through the Wauconda countryside. Start: Beach Park, 112 Park St.; transition Cook Park, 600 N. Main St., Wauconda, (847) 526-3610, waucondaparks.org. July 22, 28, 9 a.m.-3 p.m. Learn basic paddling techniques, canoe safety and river canoeing, before paddling seven miles of the Nippersink Creek completely within the undeveloped areas of Glacial Park. Bring a sack lunch and plenty of water, and wear shoes that can get wet and provide good support. Glacial Park, Lost Valley Visitor Center, 6316 Harts Road, Ringwood, (815) 479-5779, mccdistrict.org. June 30-July 1, Aug. 4-5, Sept. 1-2, Up to 1,000 dealers display and sell antiques, collectibles, and Fancy Junque. Country breakfast served on Sundays. Kane County Fairgrounds, 525 S. Randall Road, St. Charles, (630) 377-2252, kanecountyfleamarket.com. July 14, 9 a.m.-4 p.m. Experience a “Kaleidoscope of Garden Colors” by visiting various local gardens. Rain or shine. Annual event of Pottawatomie Garden Club of St. Charles. Tickets: Blue Goose, Heinz Brother’s Greenhouse, Wasco Nursery. Info: (630) 661-0702, pottagardenclub.org. July 21, 9 a.m.-2 p.m. Public car show of rare, restored and concept Pontiacs by POCI. For POCI members, starting July 17, four days of speakers, special displays, Drag Day & Poker Run, Route 66 tours, more. Pheasant Run, St. Charles. Convention info: (877) 368-3454, poci.org. July 18-22, Wed. 3-11 p.m.; Thurs. noon-11 p.m.; Fri.-Sat. noon-midnight; Sun. noon-10 p.m. Carnival, entertainment, thrill events, farm animals, kids events, food, more. Kane County Fairgrounds, 525 S. Randall Road, St. Charles, (630) 584-6926, kanecountyfair.com. July 21-22, 9 a.m.-5 p.m. Fox Valley Aero Club members and invited guest demonstrate flying of all types of radio controlled model airplanes including jets, helicopters, and giant airplanes. Free. Fox Valley Aero Club Field, Karl Madsen Drive, St. Charles, foxvalleyaero.com. July 25, 7:30-9:30 p.m. Celebrate the Year of the Bat games, crafts and activities for the whole family, followed by a short candlelight hike to the old Northern Pump Barn to witness hundreds of bats exiting for the night to begin feeding. Lost Valley Visitor Center, Glacial Park, 6316 Harts Road, Ringwood, (815) 338-6223, mccdistrict.org. July 25-29, 8 a.m.-11 p.m. Exhibits, contests, craft fair, motocross, demolition derby, more. DuPage County Fairgrounds, 2015 Manchester Road, Wheaton, (630) 668-6636, dupagecountyfair.org. July 25-29, daily. Livestock barns, competitive exhibits, fabulous food, amusement rides and some of the best entertainment around. Lake County Fairgrounds, 1060 E Peterson Road, Grayslake, (847) 680-7200, lcfair.com. July 27-28, 7:30 p.m. Cowboys, bull riders, steer wrestling, barrel racers and more at the only IPRA-sanctioned rodeo in McHenry County. Live music Friday after rodeo by Smokin’ Gunz. Milky Way Park, Rte. 173, west of Rte. 14, Harvard, (815) 943-4404, tricountyprorodeo.com. July 27-29, Fri. 4-11 p.m., Sat. 11 a.m.-11 p.m., Sun. 11 a.m.-6 p.m. Annual event draws 15,000 visitors for parade, fireworks, 5K run/walk, carnival, craft show, car show, live entertainment and, of course, corn. Volunteer Park, Main Street, Sugar Grove, (630) 466-5166, sugargrovecornboil.org. July 28-29, 10 a.m.-4 p.m. Features breeders and vendors selling exotic animals, supplies and merchandise. Hourly presentations on various reptile topics. Free raffle entry. $10 adult; $5 children. Kane County Fairgrounds, 525 S. Randall Road, St. Charles, (863) 268-4274, repticon.com. Aug. 1-5, events daily. Exhibitions, beer tent, tractor pull, demolition derby. McHenry County Fairgrounds, 1051 Country Club Road, Woodstock, (815) 338-5315, mchenrycountyfair.com. Aug. 4-5, 11:30 p.m.-3 a.m. Midnight-to-Sunrise bicycle ride and fundraiser to promote bicycling as an alternate means of transportation and exercise and to benefit The Land Conservancy of McHenry County. $30 adult ($40 ride night), $15 child under age 15. Downtown Crystal Lake, (815) 356-0531, clnightowlride.org. Aug. 11, run 8 a.m., walk 9:30 a.m. Pottawatomie Park, St. Charles, (630) 418-5309, stcrivercorridor.org. Register at signmeup.com. Aug. 9-12, 7 a.m.-6 p.m. See threshing and plowing using steam and gas tractors; steam-powered sawmill in operation, mule team and wagon rides, Corliss stationary steam engine. Lunch, kids’ activities, flea market, farm toy show, parade, more. Taylor Marshall Farm, 27707 Luken Road, Sycamore, threshingbee.org. Aug. 11, 10 a.m.-noon. Annual St. Charles Park District event, where kids of all ages enjoy climbing aboard emergency vehicles, tractors, construction trucks and more. James O. Breen Community Park, Campton Hills and Peck roads, St. Charles, (630) 513-6200, stcparks.org. Aug. 15, 11 a.m.-4 p.m. Kite demos, unique kites, food vendors, more. Peck Fields, 4038 Kaneville Road, Geneva, (630) 232-4542, genevaparks.org. Aug. 18-Aug. 19, 9 a.m.-5 p.m., Sun to 3 p.m. Loads of exhibitors with two large display layouts. For convention members, starting Aug. 14, four days of diverse layout tours, clinics on trains, gardens, ponds, dinners, more. Convention Hall. Pheasant Run Resort & Spa, 4051 E. Main St., St. Charles, (630) 584-6342, pheasantrun.com. Convention info: (630) 985-2057, 2012ngrc.com. 525 S. Randall Road, St. Charles, (630) 606-6278, elginkennelclub.com. Aug. 26, 11 a.m.-4 p.m. Rare and specialty fruits, vegetables, flowers and herbs are displayed and sold by Midwestern growers. Member participation by Seed Savers Exchange. Garfield Farm, 3N016 Garfield Road, LaFox, (630) 584-8485, garfieldfarm.org. Sept. 5-9, 8 a.m. daily. Parade, hot air balloon launch, carnival, harness racing, demolition derby, truck and tractor pulls, live entertainment. Sandwich Fairgrounds, 1401 Suydam Road, Sandwich, (815) 786-2159, sandwichfair.com. Sept. 7-9, daily. Food and wine tasting, flower markets, antique carriage rides, family games, A Fall Harvest of Natural Art, music and live entertainment, fine arts & crafts show. Downtown Geneva, (630) 232-6060, genevachamber.com. Sept. 8-9, 10 a.m.-4 p.m. A living history lesson on camp life, military artillery and war time during this late 17th century battle. More than 600 Revolutionary War reenactors from the Northwest Territory Alliance will consume the battlefield twice a day, firing cannons and muskets. Parade Field, Cantigny, 1S151 Winfield Road, Wheaton, (630) 668-5161, cantigny.org. Sept. 9, 11 a.m.-4 p.m. Colorful, whimsical and magical creations fill the skies. See dancing, stunt, fighting kites, 90-foot-long octopus kite, vendors, candy drop, more. Free. NIU’s “North 40,” Lucinda Avenue and Kishwaukee Drive, DeKalb, near Annie’s Woods & Anderson Hall. Info: dekalbcountycvb.com. Sept. 16, 7 a.m. Award-winning full and half marthon and Fall Final 20. Perfect for everyone from Boston Qualifiers to first-timers. Downtown St. Charles, at 1st St. Info/registration: (630) 549-3070, foxvalleymarathon.com. Sept. 21-23, Fri. 6-9 p.m., Sat. 11 a.m.-4 p.m. Handmade arts and crafts by award-winning artisans, historic crafts, folk art, primitives, reproductions of antique American furniture, some original antiques. Robinson Hall, Kane County Fairgrounds, 525 S. Randall Road, St. Charles, (815) 772-3279, artoftheheartlandinc.com. Sept. 28-30, events daily. Celebrate fall’s favorite fruit and the many delicious ways to enjoy it, from the village’s restaurants to outdoor food booths. Apples by the bushel, activities, live music. Historic Long Grove, (847) 634-0888, longgroveonline.com. Sept. 29, 9 a.m.-4 p.m. Live entertainment, pony rides, petting zoo, storytelling, wagon rides, farmers market. Meet Johnny Appleseed. Demonstrations of an antique cider press and peeler, contests, craft fair. Downtown Crystal Lake, downtowncl.org. This entry was posted on Wednesday, June 27th, 2012 at 11:57 am	and is filed under Recreation & Destinations. You can follow any responses to this entry through the RSS 2.0 feed. Both comments and pings are currently closed.